Kevin Iacovoni is an experienced commercial helicopter pilot and flight instructor with over 8,400 hours of flight time. He has flown a variety of helicopters over the last 20 years including the Eurocopter AS350BA/B2/B3, Bell 407, Bell206B/L, Robinson R22 and a Hughes/Sikorsky 300. In 2013, Mr. Iacovoni was recognized by the Federal Aviation Administration (FAA) with inclusion in the prestigious FAA Airmen Certification Database. The database was created to name those certified pilots who have met or exceeded the high educational, licensing, and medical standards established by the FAA. In his current position as a pilot for the East Bay Regional Parks Districe, Mr. Iacovoni is responsible for 95,000 acres encompassing 65 parks. And, as a sworn California Peace Officer, he accumulates over 1,400 flight hours per year while patrolling the parks. 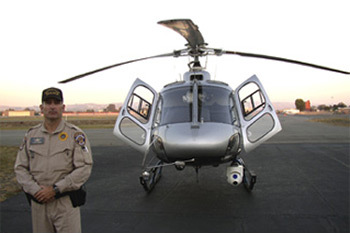 This position requires skilled use of special equipment such as gyro stabilized camera systems, a GPS moving map system, nightsun spotlight, and numerous radios. Pilot/East Bay Regional Parks: For over 14 years, Mr. Iacovoni’s responsibilities have included airborne law enforcement, wildland firefighting, and ALS/BLS Title 22 Air Rescue EMS/SAR. He operates a Eurocopter AEC-AS350B2 and B3. Pilot/Helicopter Incorporated: Operates a Eurocopter AS350BA and BH206L3/4 to provide electronic news gathering services. During the previous nine years, Mr. Iacovoni has been employed as traffic watch pilot, flight instructor, and helicopter mechanic.